Wrote off his first Tuscan and was briefly hospitalised half an hour into the official launch of the TVR Tuscan Challenge at Oulton Park in April 1989. After paying for the car retrospectively, (“happy days”), a new car was readied within six weeks in time for Martin’s first race (at Castle Combe) in ’89. Martin has owned 8 different Tuscans and competed in most of the TC races between 1989 and 2000, before finally stopping in 2002/3. He’s raced 10 different cars (soon to be 11) – the 7 previously owned Tuscans plus one outing for Henley Heritage in ’96 followed in ’97 by the ex -Chris Maries factory – owned car (nicknamed “the Belgrano” by factory team ), which was loaned to him. This car was also written off at Oulton Park after Martin T- boned Neil Anderson, (TVR chassis designer, ironically) when Neil, in factory car no.12 (also written off) lost it at Old Hall and shot back into the pack! Despite this in-house disaster, and thanks to John Reid obtaining Peter Wheeler’s generous approval, for the next race at Spa, Martin was lent the ex -Nigel Mansell Tuscan, which the 1992 World Champ tested in 1993 but couldn’t race after a touring car shunt at Donington. Martin managed to hand it back at the end of the season in one piece, much to JR’s relief. From the Belgrano’s expensive ashes, the factory built Martin yet another car (by this time his fourth new factory-built Tuscan and sixth factory supplied model). This car – the last before the current one – was sold in 2008 as a rolling chassis to an Aussie and it now resides down under. John Reid resisted selling the ex – Dave Jones Hillclimb etc car to a friend of said Aussie, and after much deliberation, Martin bought it in preparation for a tentative comeback in Class A.
Mat Smith Sports Cars successfully ran the car for Martin in 2011 producing a number of podium finishes and outright wins. 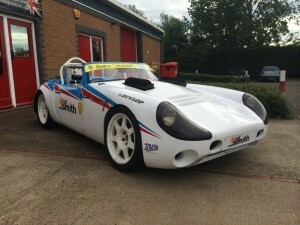 Martin Returns to the Team for 2014, with a new car again run by the team here at Mat Smith Sports Cars. We are looking forward to some great results at the front of Class A.
I must thank you for the excellent set-up on my Chimaera 500, which makes it suit both track and road. I am particularly thrilled with the suspension and brakes set-up and the way the car now handles on the track. The Gaz Gold Pro dampers you fitted work really well, especially with the different track and road settings you advised. The full geo set-up you did has made the handling, which you have nicely biased towards the track, so much more confidence inspiring, with plenty of feed back from all corners of the car. I am now able to control the "on-the-limit" slides with small amounts of steering input and with no resorting to fresh underwear. The brakes were also so much better after following your advice and fitting racing pads to the standard discs to eliminate brake fade under heavy braking. Again, very confidence inspiring. Perhaps the nicest thing of all is that I now have a really good track tool that is still a total joy to drive at any speed on the road, around town or on the fast and twisty stuff. A quick ten clicks on the front dampers, a change of wheels and tyres, and the car is transformed between track and road.